The weather in Costa Rica, just like the country itself, cannot be described in only a few words. It is varied and definitely depends on where you are heading. 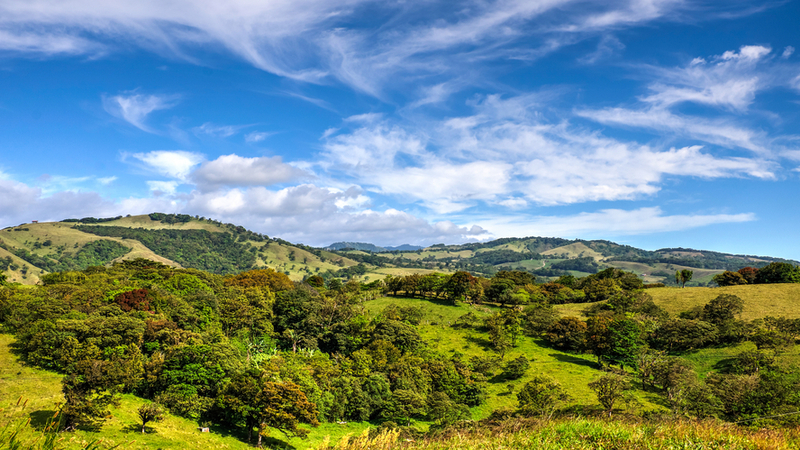 Even though Costa Rica is known to be mainly tropical, it can also be divided into several climatic zones, each one of them with it own different characteristics. If you are wondering why is the weather in Costa Rica so diverse, the answer is simple; it is due to the many elevations found in it. 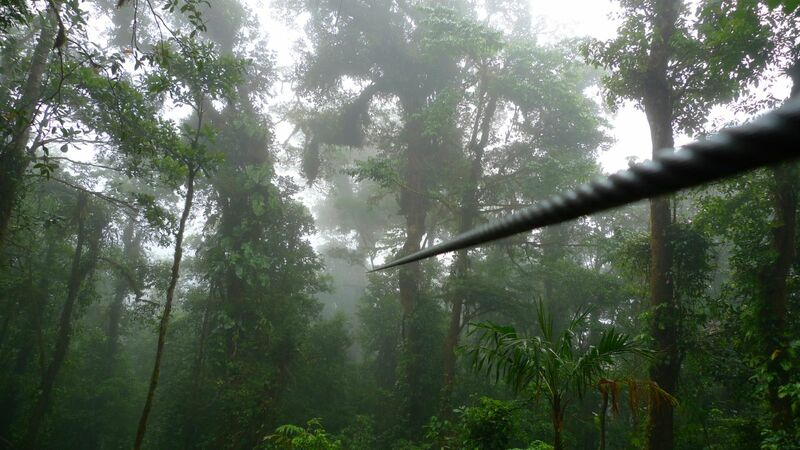 An example of this is Monteverde's Cloud Forest Biological Reserve, which is misty and foggy throughout the entire year whilst Guanacaste on the other hand is known to be dry and warm as it is located on the country’s lowlands. Still, if you are looking for the bliss point of weather in Costa Rica, then head to Central as the average temperature is 22°C (71°F), and also constantly cooled by the coastal breeze. In terms of seasons, there is the green season, shoulder and high season. The green season goes from August to October and is the time when rainfall is at its highest. There may be storms making these months the best ones in terms of surfing conditions. The shoulder season goes from May to July and also includes November. It is a time when rain picks up and the stream of tourists starts to disappear, roads are muddy and rivers begin to rise. Lastly, there's the high season which goes from December to April and is known for being mainly dry and with some sporadic rain from time to time. It is a lovely time to visit Costa Rica as the weather is very pleasant. 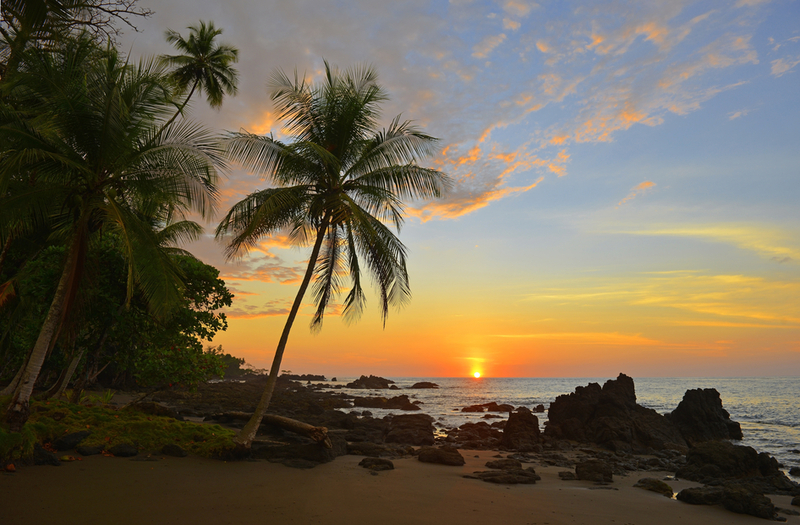 If you would like to begin creating your perfect Costa Rica holiday, Simply complete the enquiry form to get in touch. Alternatively, call our Travel Specialists on 020 8546 6222. The Hotel Grano de Oro was created by a Canadian couple who fell in love with Costa Rica and wanted to bring to San Jose what they thought it was missing; an upscale boutique hotel, that offers a unique and personalised service. - In other words, a “Grain of Gold” or “Grano de Oro”. Located on a shady street just off Paseo Colon, San Jose’s main thoroughfare, this hotel is a real retreat, converted from what was once a Tropical Victorian house. When you enter the hotel, you will find that it maintains the comfort and the welcoming touch of a private home. The hallways are lined with period photographs, and there are beautiful tropical flower arrangements and luxurious plants everywhere. The 40 rooms are all individually decorated and equipped with a fan, air conditioning, cable TV, telephone, safe deposit box and a minibar. The restaurant is another highlight as it offers dishes that are a perfect blend of French and Costa Rican cuisine under the magical hand of the French chef Francis Canal. To top it all off, you will also find in this hotel - a bar, a rooftop garden terrace with Jacuzzi, a gift shop, room and laundry service, meeting room, internet access, free parking area, as well as an accommodation that is entirely non-smoking. The Mawamba Lodge is surrounded by rainforest, in the unforgettable Tortuguero National Park. Flanked by the Caribbean Sea (and its world-famous turtle nesting sites) and the canals of the national park the hotel is a refreshing escape in the jungle. This laid-back accommodation has 50 standard rooms all built in beautiful woods and surrounded by the stunning tropical scenery. The rooms are all non-smoking and were developed in a way that allows you to experience the sounds of the Rainforest fully. What this means is that you won't find any traces of TV, radio, or even air conditioning, at the lodge as your time here is intended to be as relaxing and as peaceful as possible. There are also six superior rooms built in the “casita” style and located at the end of the estate for an extra pinch of privacy. The rooms are all independent and have ample space; their highlight is the remarkable view of the canals that surround the lodge. But wonderment is not only found inside the lodge as the excitement really begins outside of it. The activities that you can participate here are endless – from the boat trips where you will discover the incredible wildlife of the jungle to the adrenaline-filled kayak tours, or evening exploration tours – every day here is different, and every moment a new-found treasure. Lastly, the lodge also features two restaurants (one of which is conveniently located by the pool); a bar and lounge; a coffee room; a gift shop; a pool and whirlpool; the Mawamba beach; as well as the Mawamba park. Beautiful emerald green forests surround the Arenal Nayara Resort. The hotel has jaw-dropping tropical gardens and the most pristine hills. The accommodation overlooks the awe-inspiring Arenal Volcano which you can enjoy spectacular views of from almost every corner of the resort. 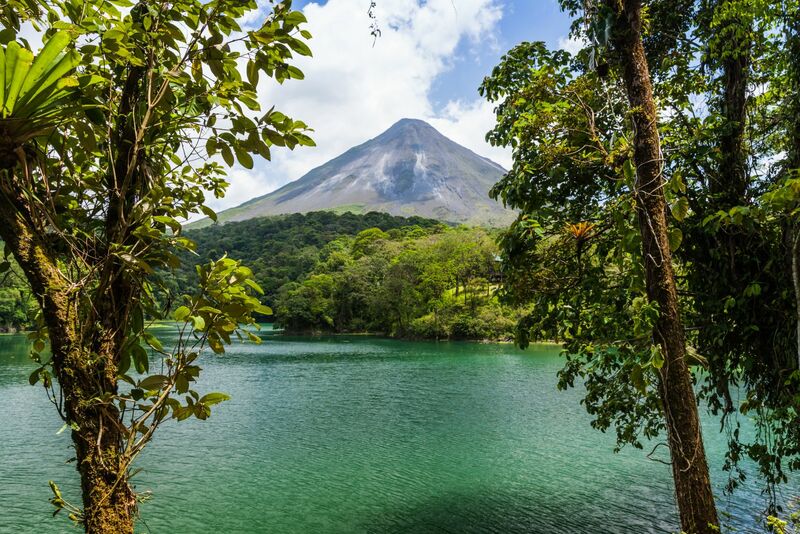 Arenal is a prime location for adventure activities as you can try a wide variety of them - soaring canopy tours, hanging bridges, waterfalls and caves, mountain biking, hiking, climbing, white-water rafting, fishing, zip lines, and even nature safaris. Still, adventure is not the only thing you can experience here; you can also do anything from - bird watching, visit ecological reserves, or the many hot springs where you can take invigorating baths. Due to this area being such a unique and biodiverse location, the Arenal Nayara Resort, has one priority above anything else – always practising sustainable tourism. Examples of this can be found in the resort's first-class facilities and amenities which were carefully built to blend in with the tropical surroundings without ever altering or stopping the organic growth of nature here. 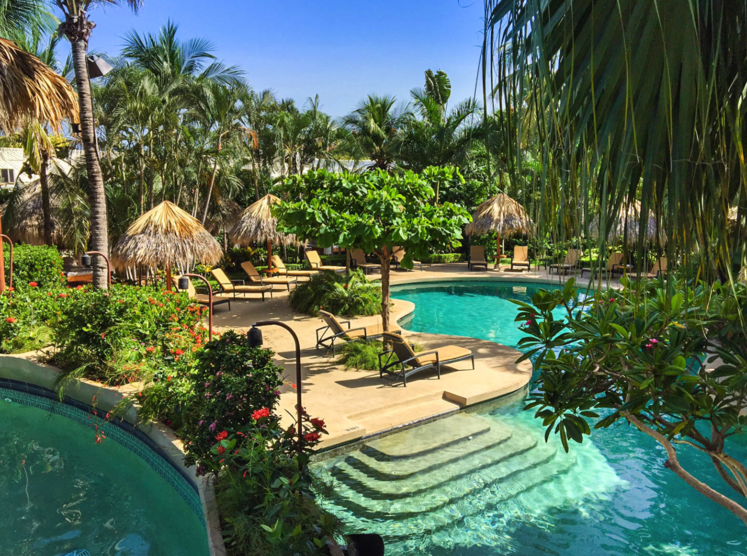 The resorts amenities are another highlight as you will find four types of rooms that you can choose from when booking your holiday here: there's the casita deluxe, the rainforest villa, the springs villa, and the three-bedroom Arenal villa. The casitas and villas feature large windows allowing to experience the nature inside. The rooms also include private gardens or private terraces with secluded Jacuzzis. This way you when you come to the resort, it's like you sleeping right in the jungle, only with an added luxury treatment. This hotel is not just another luxury accommodation, but rather a complete retreat in one of the most beautiful locations in Costa Rica. 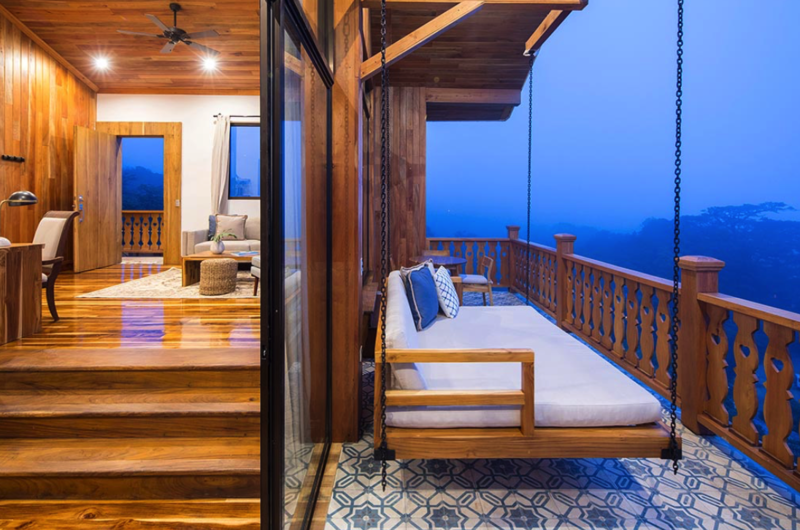 Built-in Costa Rica’s lush cloud forest, this world-renowned Hotel offers all the possibilities to experience nature to the fullest and enjoy some of the most luxurious comforts in the country. 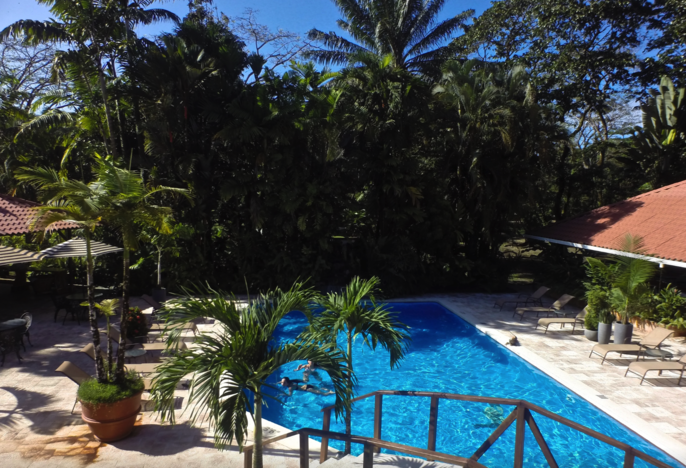 There is a wide selection of rooms that go from the principal rooms to the chalet rooms, as well as the Nicoya suites. All Belmar rooms are beautifully lit and feature handcrafted furniture and high-thread-count linens. The views of the forest are stunning from the rooms and the sunsets from the private balconies are just as unforgettable. When choosing your accommodation, all that you need to remember is that higher up you are the better, the top rooms offer some of the most incredible views and are perfect for a romantic getaway. The hotel also features yoga classes, spa services and a fabulous restaurant with yet again more amazing views. The hotel grows most of its food under a policy known as farm to table. Beer lovers take note, Belmar has a small microbrewery which produces a range of their own delicious beers including Aurorae Pale Ale, Dos Mares IPA and Nubosa Stout. As the hotel is in the famous Monteverde Reserve, sustainability is a significant part of the project (and has been for well over 30 years), the proof of that is in the 'award for five levels of sustainability' given to the hotel. Located only 7 minutes from the beach, the Jardin Del Eden is an adults-only boutique hotel with stunning views over the Tamarindo Bay. Whether you are a couple, single, or just trying to get away from the kids for a few days, this is not just a hotel; this is a paradise for adults. The rooms are decorated with global themes and have either balconies or terraces, as well as free Wi-Fi; noise reduced air conditioning, flat-screen TV, digital safe, mini fridge and a coffee machine. If you are looking for a real luxury experience make sure to book an upgraded room as these can include, a private terrace, a secluded garden, whirlpool tubs and dramatic ocean views. But the advantages of choosing this accommodation don't end with the rooms. The hotel also features a secluded beach garden located in the middle of Tamarindo beach, as well as a luxury spa and wellness centre. Other highlights are the lagoon-style pools, as well as the open-air restaurant, which incorporates a mixture of Asian, Mediterranean and Central American foods all made at the highest standard. If you are curious about the activities available at the hotel be sure that there are a few different ones that you can do be it; snorkelling, diving, horseback riding or fishing. You choose! The Gaia Hotel & Reserve is another spectacular hotel surrounded by the rainforest and its wildlife. Not only that, but the hotel is also only 7-minute drive from Manuel Antonio Beach, making it the perfect place for anyone looking to experience both the country's best biodiversity as well as the marvels of this coastal paradise. The hotel has 22 rooms of which you can select whether you like a studio, a suite or one of the two-bedroom villas. 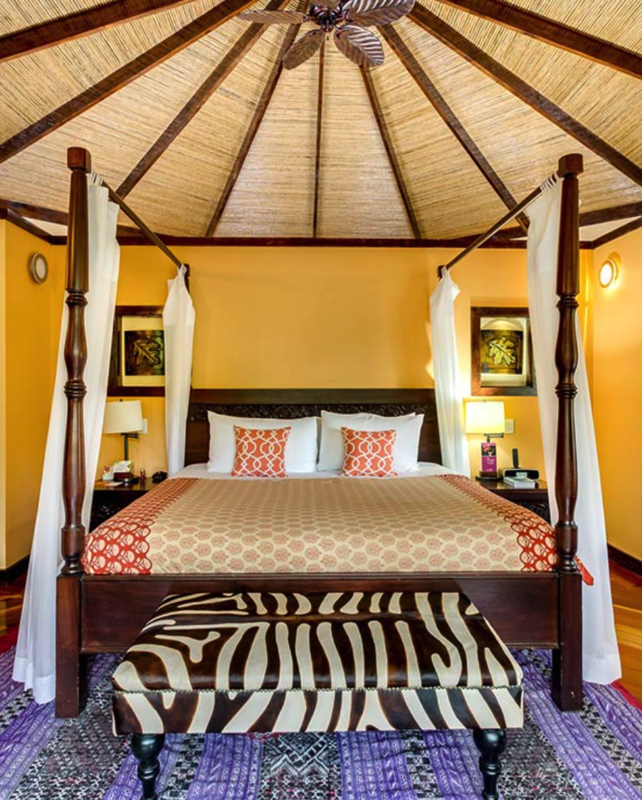 No matter what you choose, all rooms are classic and stylishly decorated featuring neutral tones, with wood and wicker furnishings, as well as air-conditioning and flat-screen TV. 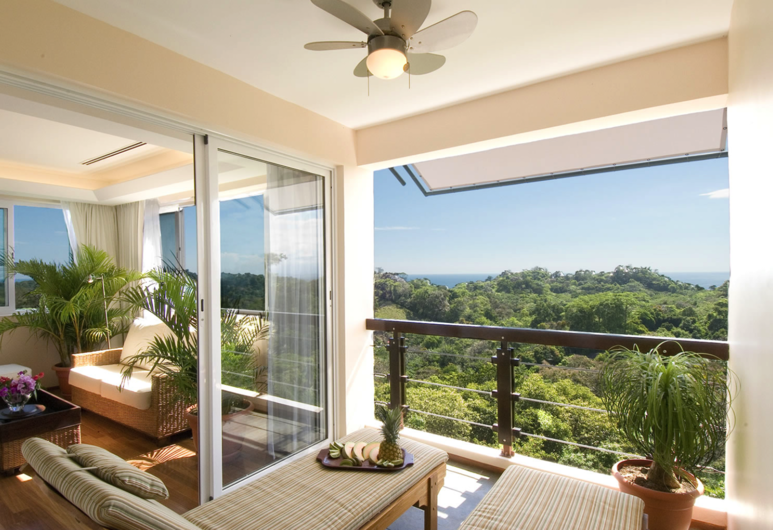 The views from the rooms are as expected, as breath-taking as the beautiful tropical rainforest surrounds the hotel. Another unique feature of this hotel is that it includes an adults-only area with a total of 18 suites with exclusive access to a 3-level infinity pool. As a luxury hotel, the Gaia Hotel & Reserve also has at your disposal a luxury spa area with a steam bath, sauna and beauty salon; a gym; and a pool. You can also enjoy an excellent dining experience at the hotel's restaurant 'La Luna'. The extensive menu and outstanding chef will ensure you have a memorable evening, make sure you head to the bar as you can enjoy some of the most dramatic sunsets over the Pacific Ocean. Other perks of the hotel include; 24-hour security and room service, bilingual staff, high-speed internet access (property-wide), a welcome drink, DVD´s, movies, and games. Lapa is the Costa Rican, word for scarlet macaw. These beautiful birds fly around the lodge everyday. When the founders of La Rios lodge first visited the area, they spotted macaws flying across the jungle in tandem, creating a river of red. After this the lodge could only have one name: Lapa Rios – River of Scarlet Macaws, in English. But what else – other than its name – makes this lodge unique? Well, once you arrive there, it is pretty apparent. Opened in 1993, this 17-bungalow lodge preserves more than 1,000 acres of primary and secondary rainforest, ensuring that all the biodiversity in this area is protected as it always should be. This means that guest have a unique opportunity to experience nature at its most pristine. It starts in your room with the breath-taking views and continues with the adventures, wildlife encounters and ocean activities that you will be able to take part in. All rooms include a seating area where you can relax after a day of activities, as well as a private bathroom fitted with a bath or shower. 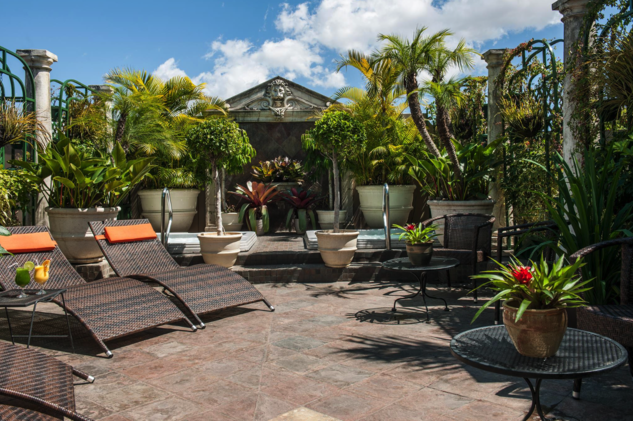 Some rooms may also feature a terrace or patio where you can enjoy the surrounding views in private. This is a place where the Golfo Dulce meets the Pacific Ocean and therefore one of the most beautiful places in Costa Rica to relax and unwind. National Parks are a major attraction in Costa Rica, but Manuel Antonio National Park, stands out among all the others. The park is well known for its astounding beaches, casual forest trails, dense rainforest, mangroves and unique wildlife. Established in 1972, the park may be Costa Rica’s smallest, but it still manages to gather 150,000 visitors every year. This comes with no surprise as the park has been listed by Forbes as one of the '12 most beautiful national parks in the world'. Here you will be able to experience a lush rainforest that leads you to the white, sandy Pacific coast; you will spot capuchin monkeys comfortably playing on the trees above you; as well as the cutest sloths with whom you will fell in love with. Here you can walk the rainforest trails and be amazed at every step you take; as well as snorkel off the pristine beaches without ever wanting to stop. 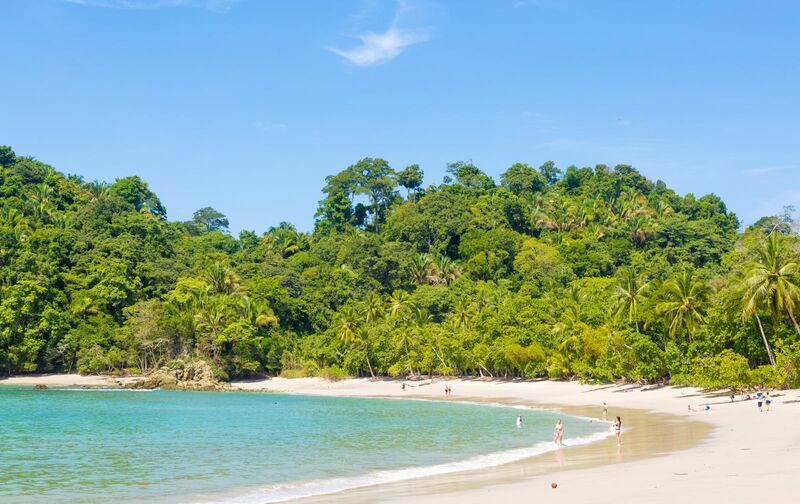 The two most popular beaches in the park are Espadilla Sur Beach and Manuel Antonio Beach, which are not more than a 30-minute hike from the main entrance of the park. Both beaches boat spectacular views, with breathtaking sunsets, and are places where you can relax or swim. 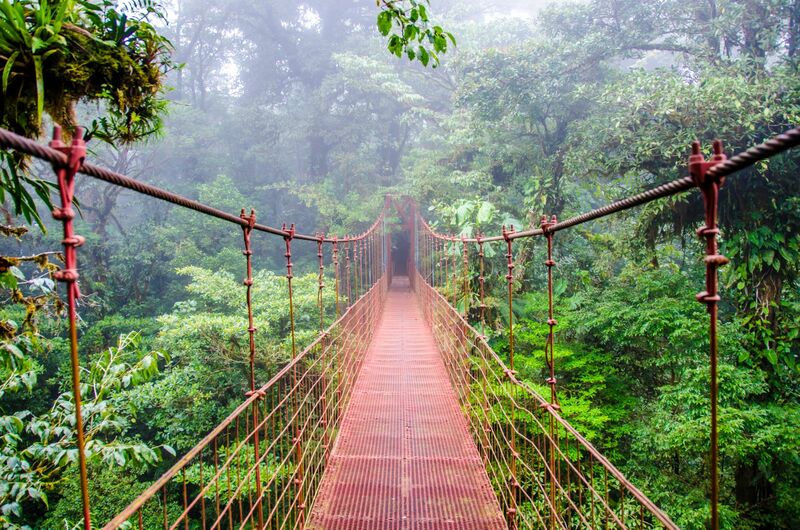 Monteverde is another prime destination in Costa Rica famous for its biodiverse forests that hide in the clouds. The landscape is not only stunning but also mysterious, especially, due to its misty air which embraces the greenery around. This can all be experienced at the Monteverde Cloud Forest Biological Reserve - “the jewel in the crown of cloud forest reserves" – as described by National Geographic. Here you will find the beautiful and colourfully plumed quetzal bird, jaguars, ocelots, as well as more than 450 specialities of orchid. 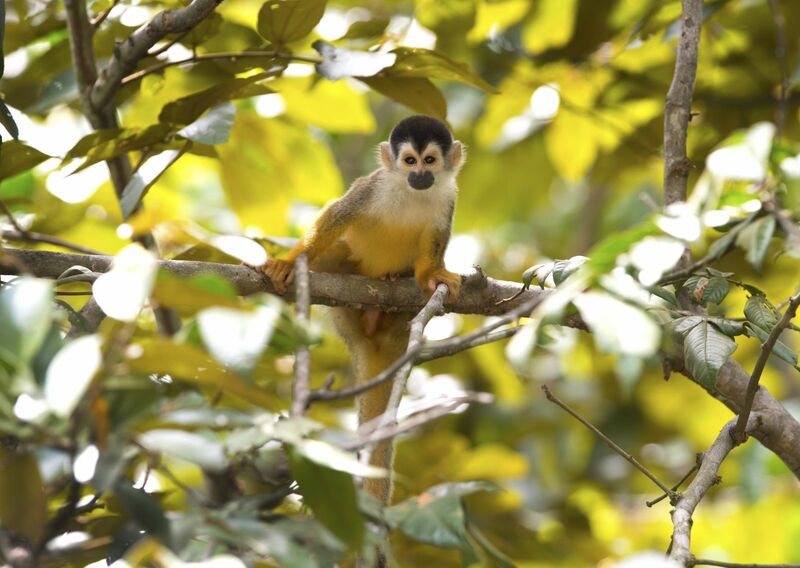 While at the reserve, tourists love going on hikes, as well as on canopy tours. But this is not all that Montevideo has to offer. This north western, mountainous town is also famous for its coffee and sugar plantations, as well as for being home to the most popular Costa Rican cheese. Last but not least, Monteverde also plays an important role in country when it comes to innovation, as it has been recognised as a major ecotourism destination in Costa Rica. The Arenal volcano is located in northern Costa Rica and is a definite favourite amongst tourists. It has access to the rainforest, the waterfalls, another volcano, the country’s largest lake, as well as several hotels. No wonder it has became so popular and well-recognized amongst visitors! This symmetrical cone-shaped stratovolcano is right in the Arenal Volcano National Park - an adventure playground where you can fly through the canopy on zip wires, visit hot springs, or take the hanging bridges which will get you as close as possible to the volcano's crater. The volcano was, till not so long ago, the country's most active one, with up to 41 eruptions a day. Even though today, Arenal is considered to be in a resting phase, you cannot hike it by yourself, and getting to close to the crater isn't an option as it is not allowed. Still there is a lot to enjoy here, and there are several tours of the surrounding area available for those interested. This is a very rich area in terms of wildlife, mainly due to its slight altitude changes, which create unique micro-climates and ecosystems that result in an environment filled with several exotic species. Tortuguero National Park may be located in one of the rainiest areas of Costa Rica, still, this is a place definitely worth visiting, especially, if you are a wildlife enthusiast. The park is located on the northern Caribbean Coast and it is only accessible by boat or light aircraft as the area is filled with a network of canals, rivers, lagoons, beaches, as well as a dense rainforest interlinked to all these. It is the perfect location for observing wildlife by boat, kayak or even canoe, making it an extra exciting and enjoyable journey, that allows you to appreciate nature in its most pristine state. But this is not the only great thing about the park, as the name suggests, this is a place to also allows you to admire sea turtles. Yes! In fact, there are four different species of sea turtles that you can view here (though perhaps not always at the same time). These include the green, leatherback, hawksbill and loggerhead sea turtles – which recurrently visit the site in order to complete their massive nesting. Can you imagine what it might feel like to witness the tiny hatchlings making their way into the water for the first time? If this is not a once in a lifetime experience, then we surely don't know what it is. Located on Costa Rica’s gorgeous Caribbean coast, Manzanillo is a place to enjoy the simple pleasures of life. As home to some of the most scenic beaches in Costa Rica, this always sunny location, is a treat for those who love relaxing and tanning. The landscapes are stunning and include fabulous white sandy beaches, lots palm trees, as well as a prime view of the always calm and gentle Caribbean Sea. The town is also quiet and there aren't many tourists here, which just adds that extra exclusive feel to this paradisiac town. But if you think that swimming and tanning is all that you can do here, you are mistaken, Manzanillo is also a perfect spot for sporty activities such as; hiking, snorkelling or kayaking. Plus it is also a great location to get more in touch with local Costa Rican ways - as this small town has been largely influenced by Afro-Caribbean traditions and customs - making it the perfect place for trying some local (and delicious) dishes, as well as to interact with the friendly locals. Golfo Dulce is just another little paradise in Costa Rica. 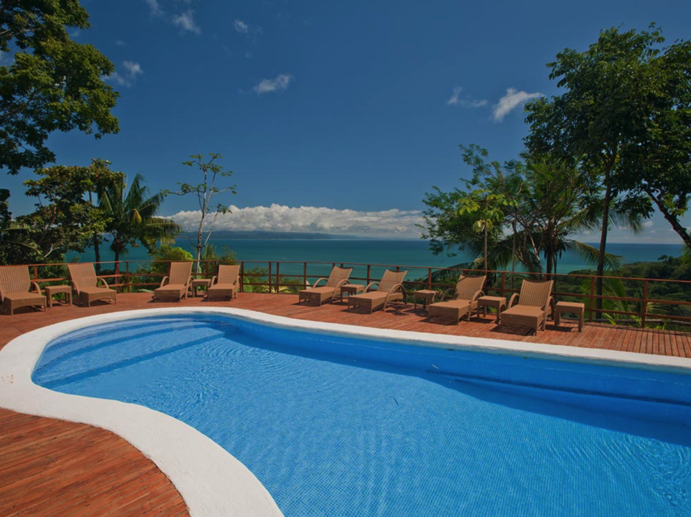 Located at the South of the Province of Puntarenas, this heaven on earth, is nothing else but a beautiful tropical fjord on the Pacific coast that no one should miss. Filled with incredible wildlife as well as breath-taking scenery, Golfo Dulce serves up a generous platter of entertainment for anyone visiting. Here you can spend hours in the rainforest without ever getting bored as you will be able to spot anything from scarlet macaws, toucans, squirrel monkeys, or even hummingbirds. The beaches are just as promising – especially Zancudo and Pavones – and are great locations from swimming, tanning, surfing and snorkelling. With so much beauty around here, the name of this place 'Golfo Dulce' (Sweet Gulf), couldn't have been better chosen. 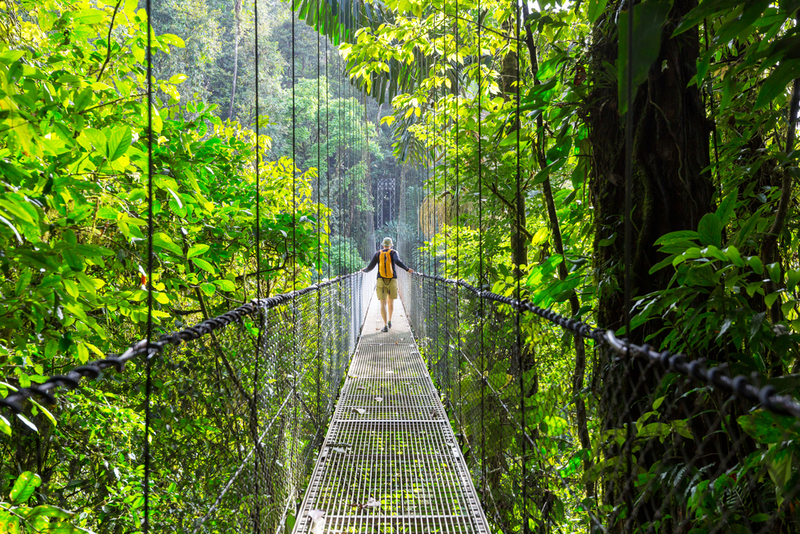 Here is another unmissable park in Costa Rica – Corcovado National Park. This reserve is located on the southwest Costa Rica's Osa Peninsula, is famous for its varied tropical ecosystems. Due to its biological wealth, this is a park that must be included in any Costa Rica itinerary, as you will find peace and harmony in every corner as well as some of the most fascinating animals on the planet. In the park's rainforest and mangrove swamps, you could find everything from - jaguars, tapirs, giant anteaters, scarlet macaws, or even squirrel monkeys; while in its river – you can see other equally impressive species like - crocodiles and bull sharks. The hikes here, are as, beautiful as you might expect. The trails follow both coastal and inland routes that include habitats ranging from Pacific beaches and mangrove swamps, to lowland and montane rainforests. If you always wanted to know what it's like to be on a nature documentary, this is the place! Guanacaste is a province in northwestern Costa Rica bordering the Pacific and best known for its unique beaches, beautiful mountain ranges, volcanoes, as well as parks which are filled with rich biodiverse. The one park that stands out here is undoubtedly Santa Rosa National Park which is home to a rare, dry tropical forest with more than 250 different species of birds. Still if Santa Rosa is not enough, and you seek even more wildlife experiences, then you should definitely also visit Rincon de la Vieja National Park as well as the Palo Verde National Park. And what better to end your day of wildlife experiences in the park, than a visit to the sea? 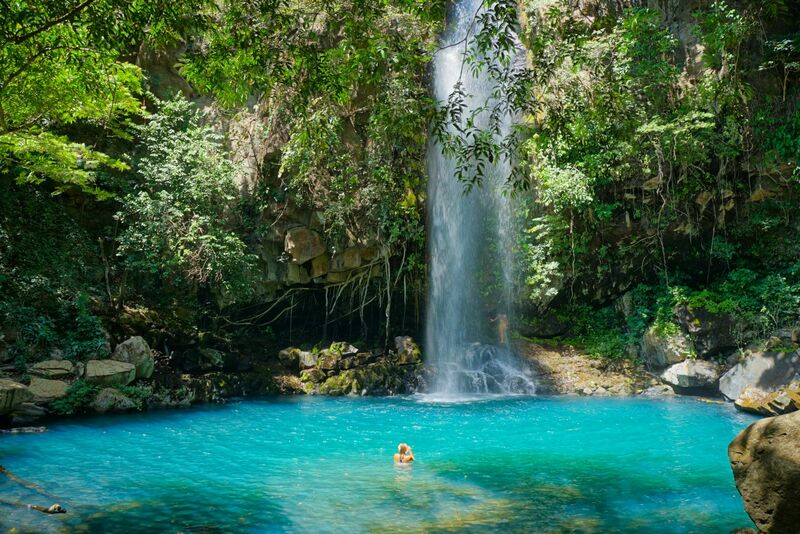 Guanacaste is also famous for having some of the best beach locations in Costa Rica such as Playa Blanca, with its calm waters, or Playa Hermosa, popular for those who love diving and water sports. But the options for great beaches don't end here as you could also head to Playa Panama, Playa Grande, Pan de Azucar, Playa Ocotal, Playa Flamingo, or, Playas del Coco beaches – all of which equally famous and pristine shorelines of Guanacaste. The weather is pleasant all year long making activities such - as surfing, snorkelling, zip line, horseback riding or, hiking - all the more enjoyable. Fancy some Costa Rican coffee? Tasting it may be easy, but have you ever wondered how exactly do the beans go from plant to cup? A visit to the coffee plantations can show you this and more! You will learn how the coffee is cultivated, processed, and roasted, all of which while having the option of staying overnight as some plantations also feature boutique hotels. But a trip here is not just about tasting or learning about coffee - can you imagine a better place to admire untouched nature? The cool, green peaks characteristic of Costa Rica are not only great for coffee production, but also fantastic for anyone looking to escape from busy environments. The central valley coffee plantations are just the perfect way to do that. Take a country drive on the stunning, curvy back roads of this region and see it all for yourself. Being a nature filled country opens doors to adventure like nothing else. All you need is a bit of imagination and the right equipment and you're fit for some adrenaline-fuelled, fun! There are activities for all tastes, our travel specialists will work with you to establish your requirements and make sure you are getting the right amount of adventure for you. What’s more, we only work with the most reputable adventure activity operators which means you can enjoy these adrenaline inducing activities with the peace of mind that your safety is taken seriously. What activities can you do? Everything thing from - canopy ziplines, class II-III whitewater rafting, ATV (all-terrain vehicle) tours, mangrove kayaking, as well as suspension bridges. - As you can see, pure fun awaits! Costa Rica is a very traditional country where people spend a lot of their time outdoors. This is particularly prevalent in the North West, where horses and farming have played an important part in the lives of Costa Ricans for generations. This connection with the land is expressed through the sabanero (cowboy) culture. If you want to experience this firsthand, Liberia is the perfect place to visit as many of the country's best ranches can be found here. 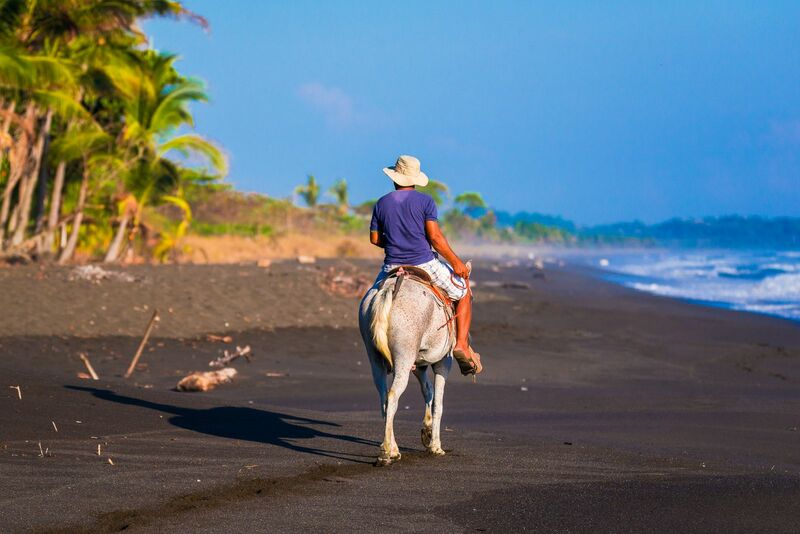 Horse riding in the ranches is an invigorating experience, you will not only be enjoying an authentic Costa Rican custom but taking in the sights of the beautiful countryside. Plus this is one of the most enjoyable ways to watch the wildlife around you – depending where you are, you might be able to spot anything from - orchids, more than 300 species of birds (including quetzals, toucanets and curassows), sloths, howlers, spider monkeys, as well as shy pumas, tapirs, and even jaguars. Who doesn't want to be a cowboy for a day! Located in the Tortuguero National Park, these canals are a hidden gem of Costa Rica. Not reachable by car, the only way in or out is by boat or by plane. The lack of modern infrastructure in this area means that everything here feels peaceful and untouched, making it just another great spot for rebalancing your energy and enjoying nature to the fullest. Unlike any other place in the world, this labyrinth of waterways gives you the unique experience of exploring dense and endless jungles, filled with the most relevant and beautiful Costa Rican wildlife, without even having to get out of the boat! 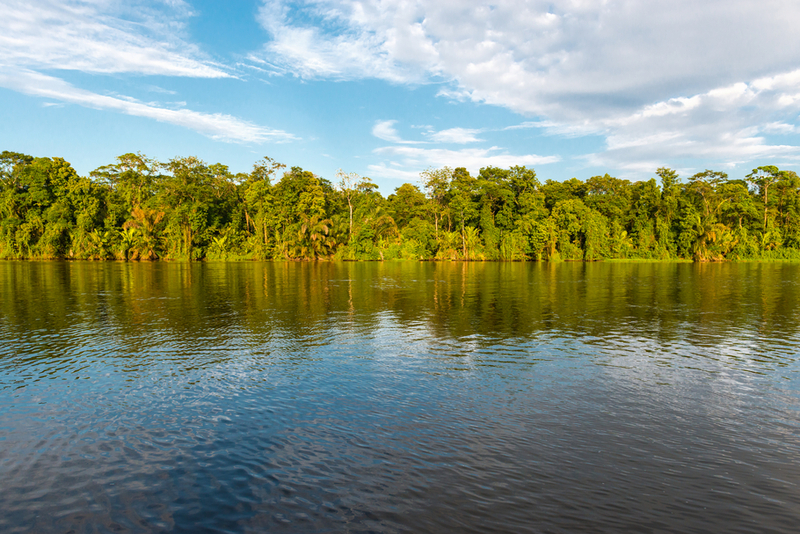 All you need to do is sit down and relax while the boat sails down the river and brings you closer to - manatees, monkeys, toucan, caimans, sloths and if you are very lucky you may even glimpse a jaguar. When the activities are over, you can relax in the comfort of your lodge, enjoying the facilities, your disposal. Nothing quite beats relaxing in the sun by the pool as the sound of monkeys and macaws reverberates through the jungle behind you. You heard it! 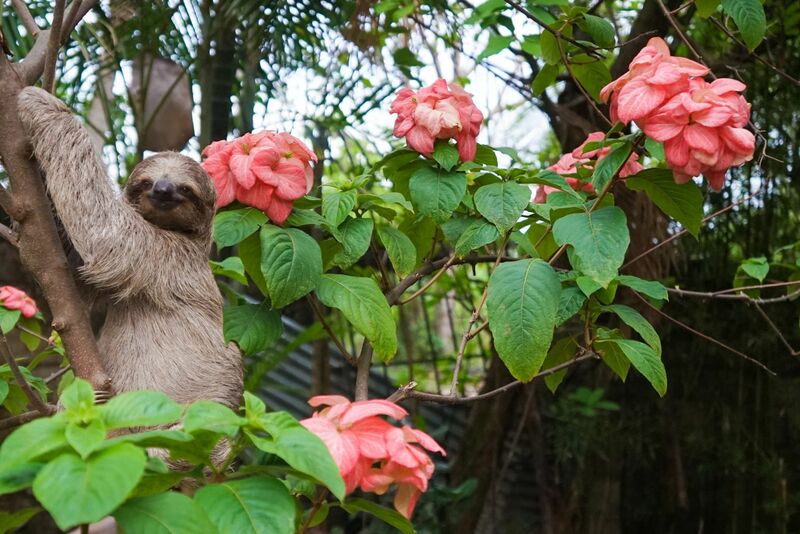 The cute, worldwide loved, sloths, can be found very easily in Costa Rica. Where exactly? Just head to Monteverde Cloud Forest Reserve, Santa Rosa National Park, Manuel Antonio National Park, La Selva Biological Station, or, Corcovado National Park - and you will surely spot a few. How? Wear neutral-coloured clothing, bring binoculars, stick to your guide's directions, be quiet and patient. We know they can be slow but it is all worth the wait! There are actually two different species in the country, so make sure to ask your guide about the ones you are able to spot. They will either be the: two-toed, or the three-toed sloths. What's the difference? The first one is the more active, and bigger. The second one - the three-toed sloth - is strictly vegetarian. Research suggests that even though they can eat up to 96 different species of plants, each individual will stick to only five or six of its own personal favourite plants. An interesting fact about sloths is that, despite what you might think, they can move quickly and are extremely agile swimmers. They are able to move through water up to three times faster than they move on land and they can slow their heart rate to one-third of its normal pace, allowing them to hold their breath underwater for up to 40 minutes This skill is more helpful to them than you might expect, as sometimes the cute but clumsy sloths, lose their grip and fall from trees into the rivers below them. Who doesn't love hummingbirds? Truth is, it is not exactly easy to spot them. Unless, of course, you come to Costa Rica and visit one of the beautiful hummingbird gardens. 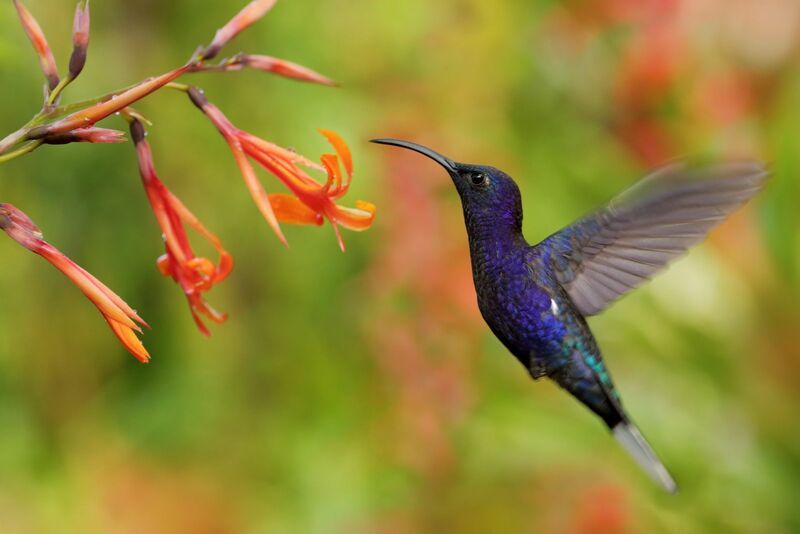 Costa Rica is known for being filled with hummingbirds and the proof is in the numbers –57 different species have been recorded in the country. One of the most famous locations to spot hummingbirds is Monteverde where it quite easy to view an impressive 15 to 20 different species a day. Hummingbirds have no fear of humans, so you can stand just inches away from the feeders and photograph the hummingbirds up close. Among the 57 different species are – the magenta-throated woodstar, the green thorntail, the purple-crowned fairy, the cinnamon hummingbird, the bronze-tailed plumeleteer, the green- crowned brilliant – to only name a few. If you are an animal lover and always wanted to get near these stunning little birds, this is a must for your Costa Rica list of activities! 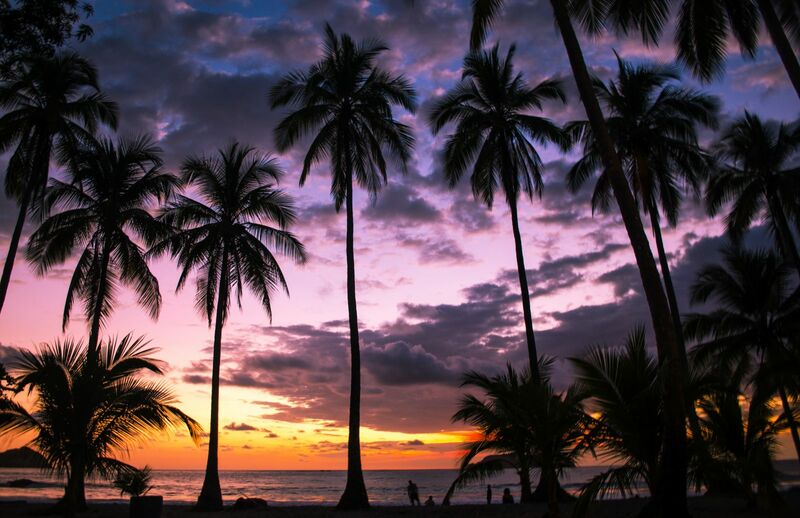 Along with some other countries, Costa Rica enjoys some of the most impressive sunsets in the world. Whether you see it setting over the wide blue ocean or falling behind the lavish green rainforests, the Costa Rican sundown is certain to become one of your most cherished memories on the trip. All you have to do is gather your favourite people around by 4.30, give them all a generous glass of wine and enjoy the moment. The sun is completely set by 6pm so don't waste time! Can you imagine anything more endearing than visiting a sea turtle nesting site? Well, here is your opportunity to visit one! Costa Rica has four species of sea turtles - olive ridley, leatherback, green, and hawksbill sea turtles. What do all of these have in common? They visit the Pacific and Caribbean Coasts a few times per year making it possible for any tourist passing by Costa Rica to witness the moment. They nest in more than one location, still, they can all be spotted at the Tortuguero National Park, where you will find the largest nesting site for green sea turtles in the Western Hemisphere. So what are the differences and similarities between these for species? Well, the olive ridley sea turtle is famous for its mass annual nesting migrations called 'arribadas'. These are difficult to witness though as they are hard to predict, so beware that you might not be able to book a tour to see the arribadas in advance. The other three remaining sea turtle species can be put in the same category as unfortunately, they have one big thing in common: they are all endangered species. The green sea turtle can be found mostly in the Tortuguero National Park and it features a dorsal shell that is wide, smooth, as well as brownish-olive in color. ; the leatherback sea turtle has the title of the biggest of the species and can be found nesting along the Pacific. The last one - the hawksbill sea turtle - is the least frequently seen sea turtle in Costa Rica of all for four species. This is due to its decline in numbers, as well solitary nesting habits, which make an encounter with this particular sea turtle a very, rare, but also lucky one. 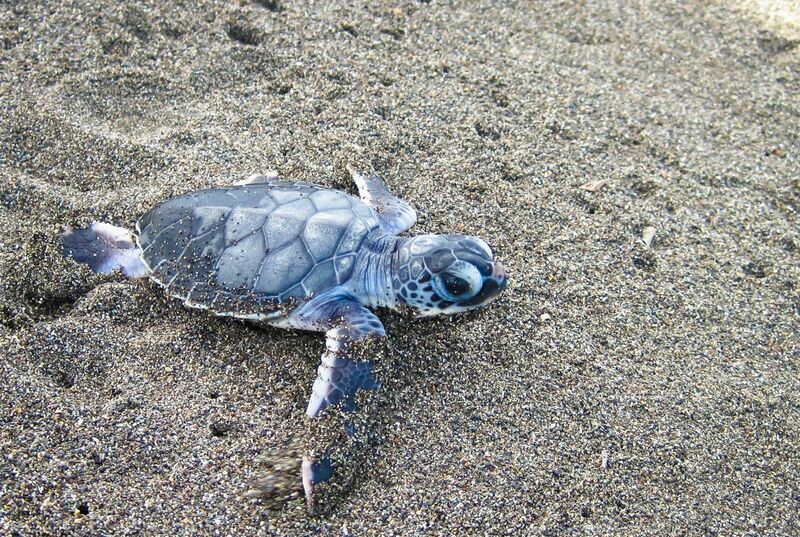 The green turtle hatching season runs from July to October and leatherbacks from February to April. If there is a place where you can definitely put on your hiking shoes it's Costa Rica! Hiking trails can be found all over the country and can range from mild flat hikes, to overnight journeys. Just like in the adventure activities there's something for everyone. You can do anything from - volcano hikes, waterfall hikes, hanging bridges, mountain hikes, night tours, and of course, national parks, as they all have hiking options. If you have the time and energy it is even advisable to try more than one hike as they provide incredibly different landscapes with the most incredible fauna and flora. Simply put, it is just a great way to get more acquainted with Costa Rica's wealth of nature. Just don't forget to bring some comfortable hiking gear, sunscreen, bug repellent, backpack, water, and of course, snacks! After so much nature and outdoorsy activities, it is time to loosen up, and get into party mode! Carnival is not only grandiose in Brazil, the Caribbean coastal city of Puerto Limón comes to life in a pure burst of extravagant colour, nonstop dancing, tasty food (“Rica and Beans”), as well as lots of good spirits! The event usually lasts about a week, and is a celebration in honour of Christopher Columbus, who first arrived in Puerto Limon back in 1502 while on his 'New World' explorations. The festivities are also meant to honour all the immigrants who later came from all over the world; making Limon's Carnival, not just a party, but more like a praise for diversity in Costa Rica, that aims to bring everyone together. - If you are visiting Costa Rica in October, this is too fun to be missed! Welcome to the happiest place on earth – Costa Rica! A place with so much sunshine and natural beauty, that it is not difficult to see why the people here are so happy. – Renowned for its biodiversity, the purity of its rainforests, the pristine charm of its coastline and some of the best adventure activities in the world – whatever it is that conquers your heart in Costa Rica, there is only one-word fit to describe the feeling you will get from a holiday here; wonderment. When coming to Costa Rica, there is so much to see that it is almost impossible to be selective. Spending time immersed in nature will be a major part of your trip, the country has a total of 27 national parks, 58 wildlife refuges, 32 protected zones, 15 wetland area (mangroves), 11 forest reserves, 8 biological reserves, as well as 12 other conservation regions that protect the distinctive and diverse natural habitats found throughout the country. As the years pass more of the country’s beautiful wilderness is being protected. But what else draws people to this Central American country? 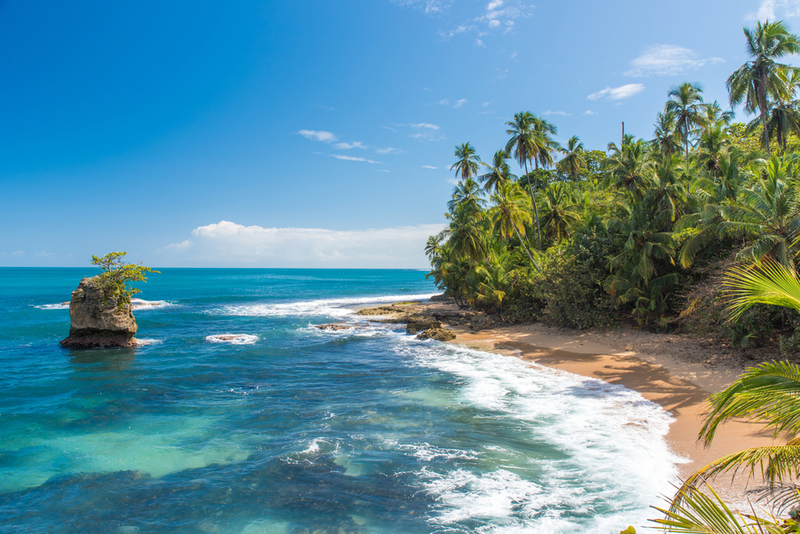 Other than the natural parks and the species that live in them (Costa Rica is home to more than 500,000 different species), the country is renowned for its gorgeous coastline. Costa Rica borders both the Caribbean Sea (to the east) and the Pacific Ocean (to the west) - with a total of 801.6 miles of coastline (131 miles on the Caribbean coast and 631.3 miles on the Pacific) – no one can expect anything else but to find some of the most beautiful beaches, unspoilt beaches in the world. The truth is, Costa Rica doesn't take its rich fauna and flora for granted, and constantly gathers efforts to maintain great sustainability policies. Something you would expect from a place that has been listed as one of the '20 countries with the highest biodiversity in the world' and is estimated to hold 6% of the world’s plant and animal species. That is why 27% of the country's landmass is devoted to national parks and reserves, and why the tourism industry is fully supportive of sustainable practices. It just couldn't be any other way. As you explore this tropical paradise one versatile phrase you will become familiar with is Pura Vida - Spanish for pure life - it is used as a greeting, a farewell and to say everything is well, - but at its heart, it is so much more than a saying, it’s a way of life. Its emblematic of Costa Rica’s relaxed and stress-free attitude. Costa Rica is home to one of the only five Blue Zones in the world - where people commonly live active lives past the age of 100 years. So, with a land of sustainability, adventure, youth, happiness and natural beauty just a direct flight from London Gatwick, what are you waiting for? Get in touch with one of our travel specialists and organise your dream trip today. Any element of your holiday can be made truly individual to your requirements, including the places you want to see and the things that are important to you. Just contact one of our Travel Specialists today. What to expect on your holiday to Costa Rica? The Latin Routes team have returned from a thrilling trip to Costa Rica, you can see what they got up to below. Our Highlights of Costa Rica holiday takes in Costa Rica’s best highlights and most dramatic scenery in a 12 day action packed holiday. We have put together an exceptional package to discover the formidable birdlife in the best places in Costa Rica in 14 days. The major attraction of Costa Rica is the wildlife, from birds and mammals to reptiles, fishes and plants. You will see all of this in a unique wilderness and tropical environment. On this journey, you will self-drive through the diverse landscapes of Costa Rica in a rental car. You will have the chance to visit the country’s most fascinating places.